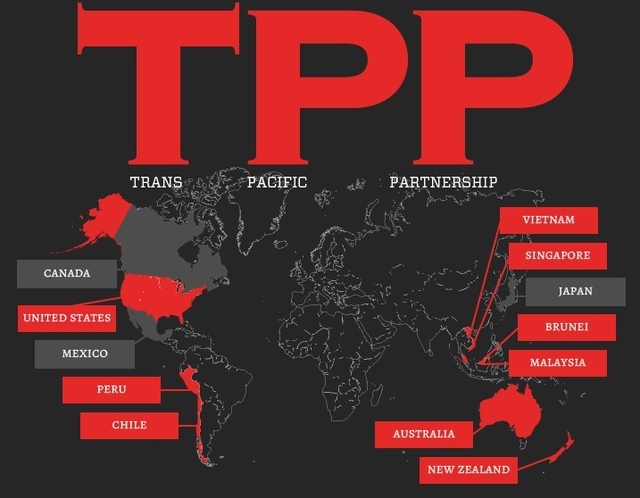 In the last two days, it appears as though momentum on the Trans-Pacific Partnership fight has shifted heavily in favor of President Obama and his corporatist allies across the political spectrum. Despite an embarrassing defeat in the House two weeks ago—when Democrats and union activist killed the Trade Adjustment Assistance that they usually support in order to scuttle the advance of the TPP—Obama’s trade agenda is advancing steadily and may have just reached the point of no return. Yesterday, the Senate voted 60-37 for cloture on the House’s Trade Promotion Authority (fast-track) bill, and will be voting later today. As it only takes 51 votes in the Senate for this bill to pass, it is virtually a done deal (barring an extraordinary mutiny from party leadership). The inevitability of this passage is made even clearer by the announcement from Nancy Pelosi today, that she should direct her caucus to stop obstructing the TAA. With the passage of the Trade Promotion Authority, the president will be given the power to negotiate trade deals on behalf of our country for the next six years, then submit them to the legislative branch for a simple confirmation or rejection—debate will be limited to 20 hours in each chamber and no amendments will be allowed. It is important to stress that this transfer of authority to the president is attached to the Office, not the individual. This means that whoever is elected in 2016—whether it is Hillary Clinton or Donald Trump (if so, I’m making a run for the Canadian border)—will also have the power to submit trade deals under TPA. While the Trans-Pacific Partnership is the first trade deal that will be introduced under this TPA, it is also likely that the Trans-Atlantic Trade and Investment Partnership will be finalized before the six years ends, thus it will also be passed under this authority. Put simply, this is an unmitigated disaster that will haunt our country for decades to come. 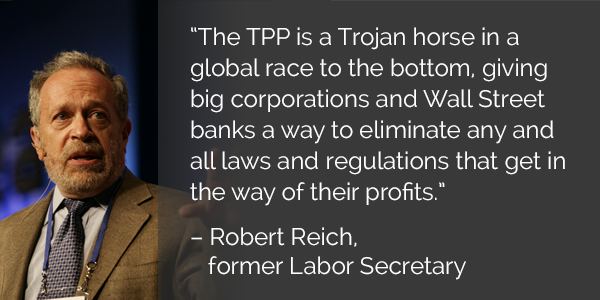 The passage of the TPP will cause massive harm to our country by eroding our power to regulate business, increasing the export gap, and driving down wages. It will increase the power of corporations to apply restrictive copyright laws to destroy competition (particularly for pharmaceuticals) and will erode our national sovereignty. Democrats who voted for this are an embarrassment who have proven once and for all that they are corporatists, not progressives. They have joined hands with the Republicans to screw the American people, and I have little doubt that most of them will reap massive “lobbying,” “consulting,” or “speaking” fees from the big corporations that stand to make billions off of this deal. This betrayal of our national interests by the Republicans is no better than that of the Democrats (actually it is better in some cases, as some Republicans are stupid enough to legitimately think that this deal is good for our nation, making them ignorant and dangerous, but not immoral) but it is far more expected. Over the last decade, they have proven themselves to be a very effective wing of the multi-national corporate establishment and this vote is no surprise. This is one of the only initiatives they have ever voluntarily reached across the aisle for, and almost certainly the only one that they have been enthusiastic about. Just to put this into perspective, remember that they were the party that filibustered the aid bill for first-responders for 9/11 in order to spite Obama, yet they actually held a standing ovation for the president after their vote for the TPA bill last week. On the more grassroots conservative side, for all of their talk about the UN, the “threat of global government,” and black helicopters landing international troops on US soil to oppress us, the right wing base has completely ignored the realization of their irrational fears. Only, instead of UN troops, the people who oppress us will be well-dressed corporate lawyers; the “global government” will be composed to tribunals of corporate shills that have the power to steal your money to repay corporations for the inconvenience that comes when they are stopped from poisoning your family; and the black helicopters will be the much more banal town cars that the rich will buy with money earned from exploiting your labor. Where are the right wing activists picketing their elected officials a la the ObamaCare fight? Why didn’t those large “grassroots” Tea Party organizations get as involved as the labor unions did? Doesn’t anybody on that side of the political wonder why those fancy busses and pre-made signs didn’t show up this time? Of course, the answer is simple: The Washington establishment is corrupt and the American people are largely ignorant. There are certainly a number of principled Progressives, and even a handful of principled Conservatives, but the vast majority of our political system has been bought and paid for by the people who buy our elections and bribe our politicians. 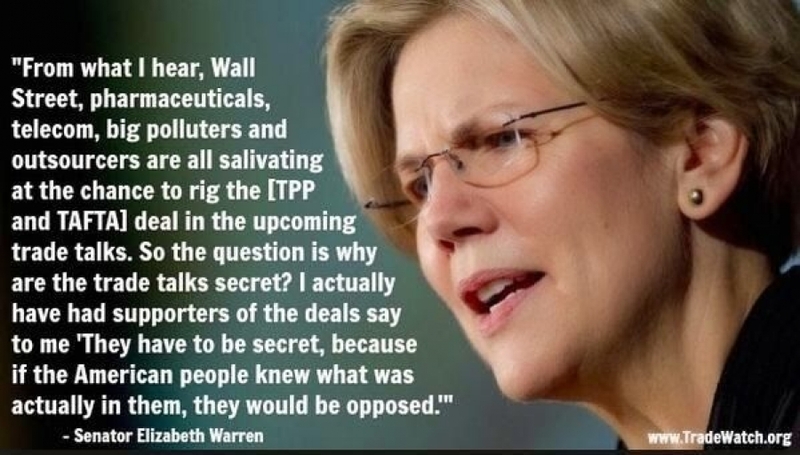 While we may not be able to stop the TPP in time, we must punish every politician to have a hand in passing it come election time, and reform our campaign laws to prevent this corruption. We must eliminate money from politics, establish strong revolving door laws, and actually attach severe consequences to any violations of the public trust (ex. real jail time, civil asset forfeiture, etc.). Totally agree with the last paragraph. Though the American people are ultimately responsible for the government we get, there has to be a price paid for violating our trust.